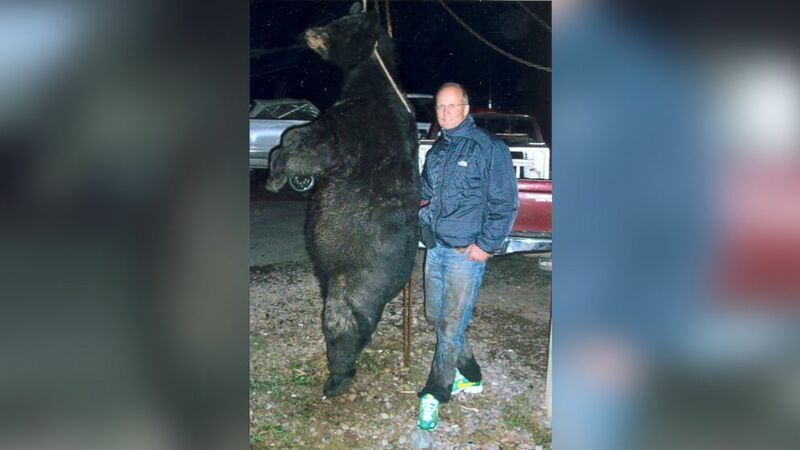 Walter Palmer has a felony conviction for his involvement in the bear's killing. 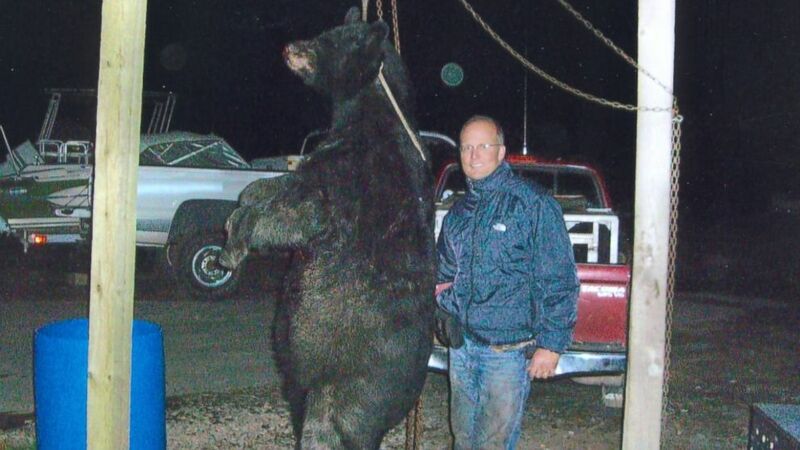 Photos recently obtained by ABC News’ “20/20” show Minnesota dentist Dr. Walter Palmer posing with the large black bear he illegally killed while hunting in Wisconsin in 2006. ABC News’ “20/20” obtained photos through a Freedom of Information Act request. Palmer has been avoiding the public eye since the world learned that he killed Cecil, a well-known 13-year-old male lion, just outside Hwange National Park in Hwange, Zimbabwe. He allegedly paid veteran safari guide Theo Bronkhorst at least $50,000 to help him bag a big lion in Zimbabwe when he went on safari last month. In an interview with the British newspaper The Telegraph, Bronkhorst said their hunt was delayed and he and Palmer instead went to hunt on a farm abutting Hwange National Park, rather than an approved area. An accomplished bow hunter, Palmer has hunted big game around the world, including moose, deer, buffalo, mountain lions and even a polar bear, according to the New York Times. And he had gotten into trouble in the past. In 2003, Palmer was convicted of a misdemeanor in Otter Tail County, Minnesota, for fishing without a license and paid a small fine. Three years later, in September 2006, Palmer was hunting black bear in northern Wisconsin when he shot a bear in an area where he wasn’t allowed to hunt, shown in these photos below. According to court documents, Palmer had a permit to kill a bear in one county, but he shot the bear 40 miles from away in an area where he did not have a permit to hunt. (Wisconsin Department of Natural Resources) In 2008, Dr. Walter Palmer pleaded guilty to making false statements to the U.S. 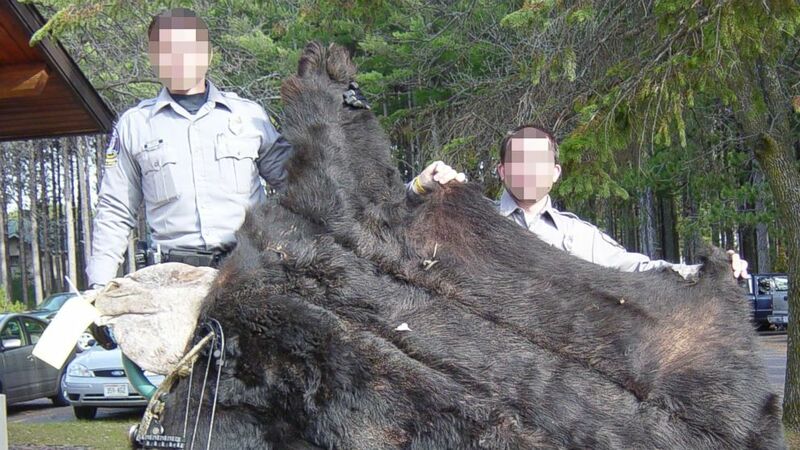 Fish and Wildlife Service about a black bear he shot and killed in Wisconsin outside of an authorized hunting zone. Palmer and the bear are pictured here. (Wisconsin Department of Natural Resources) According to the Wisconsin Department of Natural Resources, Palmer shot the bear with a bow and the aid of bear dogs. Vaudreuil got involved when Palmer took the bear across state lines back to Minnesota. “He was lying to us. He was offering to pay, it turns out, about $20,000 to keep the others who were in the hunt, to have them lie, so that’s a fairly aggressive cover-up,” Vaudreuil said. But the bear guides didn’t lie to authorities. In 2008, Palmer pleaded guilty to felony charges of making false statements to the U.S. Fish and Wildlife Service about the black bear he shot and killed outside of the authorized hunting zone, according to court documents. He paid $2,938 in fines and was sentenced to a year of probation. 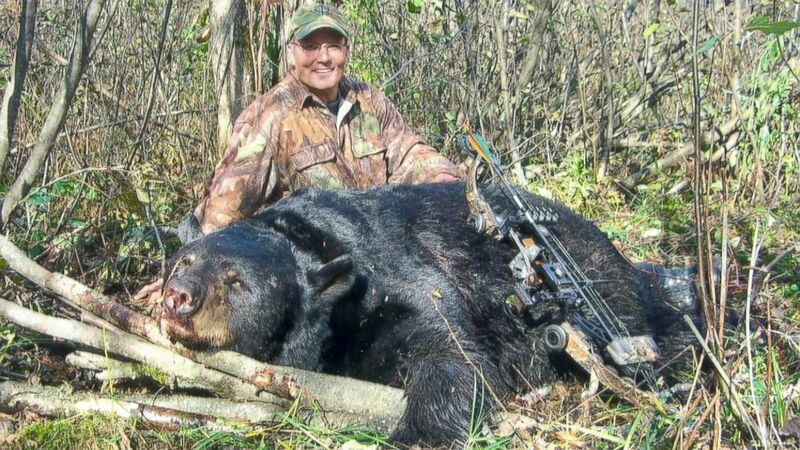 (Wisconsin Department of Natural Resources) Palmer poses with the black bear he shot and killed in Wisconsin outside of an authorized hunting zone in 2006. (Wisconsin Department of Natural Resources) Wisconsin Department of Natural Resources wardens hold the remains of the black bear shot by Walter Palmer in this undated photo. In connection with Cecil the lion’s death, Zimbabwe’s environment, water and climate minister, Oppah Muchiniguri, said at a news conference last month that the Zimbabwe government was seeking to extradite Palmer for hunting without the proper permits. The U.S. Fish and Wildlife Service has opened its own investigation. In a statement, Palmer, who temporarily closed his dental office, admitted to killing the lion but said he had no idea that Cecil “was a known, local favorite, was collared and part of a study until the end of the hunt” nor that they were in a restricted area. Police arrested Bronkhorst, and he and a farm landowner named Honest Trymore Ndlovu are facing criminal poaching charges in connection with Cecil's death. Bronkhorst told authorities that Palmer fired the final blow that killed Cecil. Bronkhorst’s lawyer Givemore Muvhiringi told ABC News that Bronkhorst and the hunters didn’t set out to kill Cecil. Tune in for the full story on ABC News' "20/20" TONIGHT at 10 p.m. ET.